Summer is in full swing in London. It has been record-breaking heat only this week has we seen some rain to cool things off. The heat has made it hard for me to train when I get home from work. I also find I need an additional water bottle each day to stay cool. How else have I been surviving? As I mentioned, it is too hot to run when I get home from work. That means I am headed out after dinner. It is a bit of a no-no to exercise so close to bedtime though. Your endorphins will be flowing through your bloodstream, making it harder to relax for bed. I find taking a cool shower and having a cup of Higher Nature Performax Relax bedtime sachet helps relax me. The taste is very subtle and the active ingredient, theanine, will calm you. Magnesium is also a powerful relaxation aid. The ritual of having a hot drink is a big part of British culture and this routine will also let your body unwind. We have also been making our own popsicles as an after-supper treat by mixing plain yogurt with a splash of orange juice and honey to taste. You could also add in a few small pieces of fruit or freshly chopped mint. Although it isn't quite as satisfying as Ben and Jerry's Phish Food, it is still refreshing and sweet. Since we have yogurt in the fridge for the popsicles (I gave up a daily yogurt in my lunch after my first round of the #Whole30), i have used the leftovers for protein smoothies as a workout recovery drink instead of a shake. This is something we did a lot in Michigan when we had more counter space to leave out the blender. We have fallen out of practice in London as kitchen counter top is a valuable resource but I am hopeful the blender will be back in action as we organize our new kitchen. Here is the basic recipe for which you can make more of a treat by adding raw cocoa. This makes 2 servings. 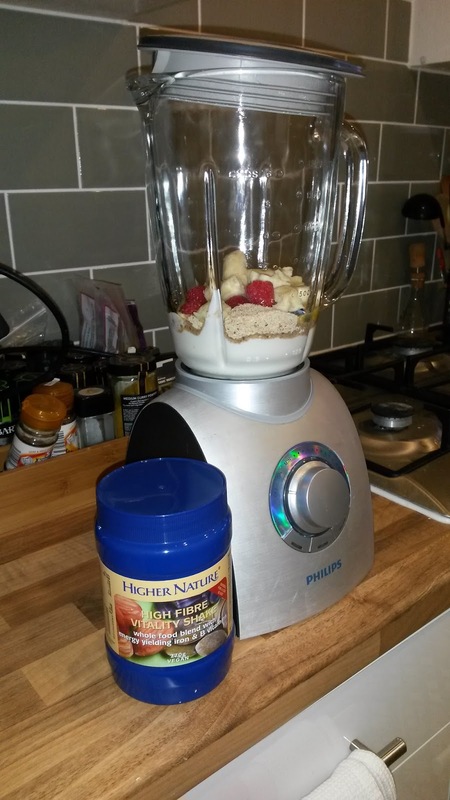 The Higher Nature fiber is textured so you want to be sure to blend well (I tried with plain old milk in a protein shaker). Remember with a smoothie you want to take your time & enjoy it. The blended fruits have released their nutrients all at once so you will not take long to digest it and might feel hungry again soon after. Finally, the protein will assist your muscles as they repair. The last thing to do remember in this heat is to stay hydrated. Ideally you would be adding High5 Zero Electolyte tablets or nuun tablets with electrolytes to your water but these can be quite expensive. 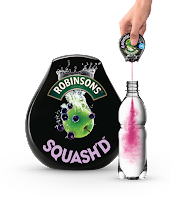 Robinsons's now have a portable squash squeeze bottle (appropriately names SQUASH'D) that can easily fit in your bag or a desk drawer. Squirt some into your glass to add flavor as you re-hydrate without any added sugar. Makes 20 servings so should last you a month. How are you staying cool this summer without sacrificing your workout regime? Leave a comment below and let me know. Higher Nature sent me complimentary samples of their products. All opinions are honest and my own.